The Dental Profession learned well over 15 years ago how to safely whiten natural teeth. Still today the best teeth whitening (safest, most reliable) employs dentist supervised custom teeth whitening trays and professionally dispensed bleaching gels. This is the only way to get proven, consistent long-term results without lasting tooth sensitivity. Let me say again that no special lights, lasers or heat applicators produce safe, reliable, consistent results…yet. As a professional teacher of Esthetic/Cosmetic Dentistry, it’s my job to know the current science. Teeth whitening at home with vacuum formed custom mouthguard trays that we make for you and the teeth whitening kits that we recommend are the gold standard of care today. The correct choice of products can get your teeth gradually and safely whiter with even only 1-2 hours of use per day. New additives to the whitening/bleaching gels have made this process even better. 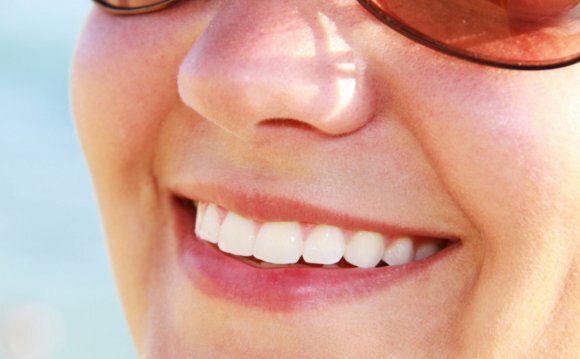 Calcium phosphates and other minerals can even strengthen your teeth while they are being whitened! Yes, recent publications explain how re-mineralized tooth enamel may be even stronger than your original enamel. Please don’t trust internet advertized products and specials—what you may get is either no lasting effect, or even harmful sensitivity or damage to your teeth. Our newly developed teeth whiteners facilitate the best teeth whitening for sensitive teeth. Unfortunately, we do not yet have a whitening product that works on old crowns, bridges and laminate veneers.